Home > Hazardous Substances & Chemicals > COSHH Warning Signs & Stickers > COSHH Tapes > Caution Radioactive Material COSHH tape. 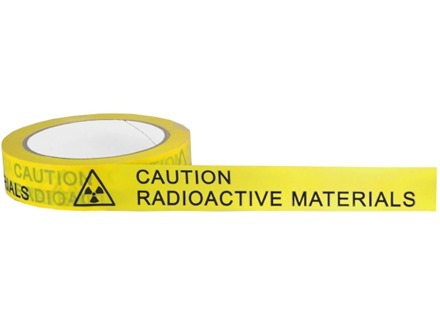 Caution radioactive material COSHH tape.Self adhesive tape to mark hazardous substances or dangerous goods, which are emitting radiation energy. These can be in liquid, solid or gas state, and these tapes aid their safe handling. COSHH (Control of substances hazardous to health) tapes for sealing packages, parcels and containers to identify the risk of the contents. 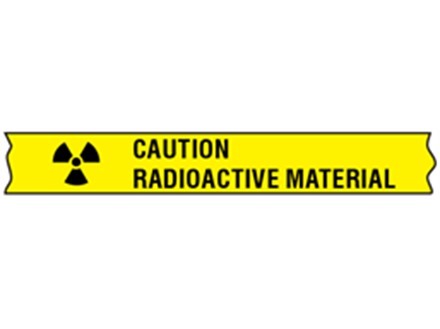 Caution radioactive material (with trefoil symbol). Tapes comply with the Control of Substances Hazardous to Health (COSHH) 2002. HGT011 Size 25mm x 66m. Material self adhesive vinyl.